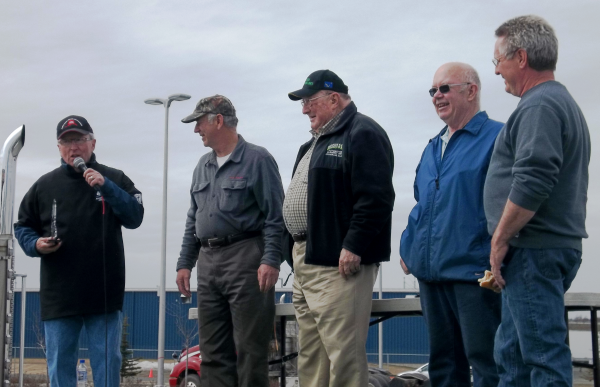 Lynden drivers were behind the wheel at the Alaska Trucking Association’s (ATA) 14th Annual Truck Driving Championships May 11 in Anchorage. Professional drivers must complete a written exam, a pre-trip inspection and an obstacle course as part of the rigorous competition. 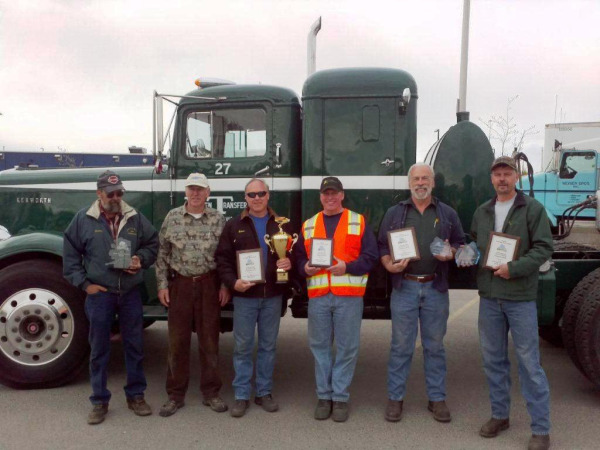 Lynden Transport driver Jack Sorensen took second place in the 5-axle Day Cab division and driver Tom Martin placed second in the Flatbed class. 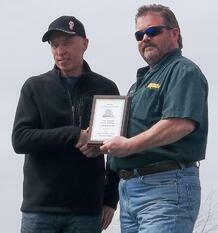 Brian Ambrose of Alaska West Express also competed as did Lynden Chairman Jim Jansen. Jim was part of a team called the “Desk Bound Geezers” made up of Wilbur O’Brien of Alaska Freight Lines, John McDonald of Carlile and Richard Assay of Assay Trucking. Wilbur took first place, Jim second and John and Richard, third and fourth, respectively. “Wilbur is one of the original Alcan drivers who drove for Alaska Freight Lines,” Jim says. “He drives Old No. 27 around Alaska for us, plus other projects for Lynden. He is an honorary Lynden employee and a great friend to us." Above photo: Tom Martin (at right) and Jack Sorenson (far right) accepting their awards. Top right: Jim Jansen (second from left) accepting his award with the 'Deskbound Geezers' team. Wilbur is third from the left. 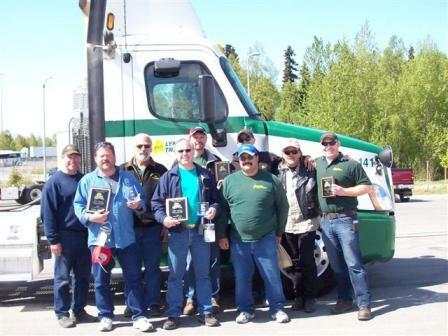 Lynden Transport and Alaska West Express drivers took the top three spots in the Alaska Trucking Association’s 13th Annual Truck Driving Championship in Anchorage in May of this year. Alaska West Express Driver Brian Ambrose earned first place overall followed by Steve Daugherty and Russ Cox of Lynden Transport. All three drivers are eligible to compete in the national competition in Minneapolis. 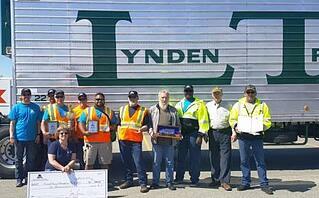 “We cleaned up,” says Richard Hennigan, Lynden Transport Health and Safety Supervisor. 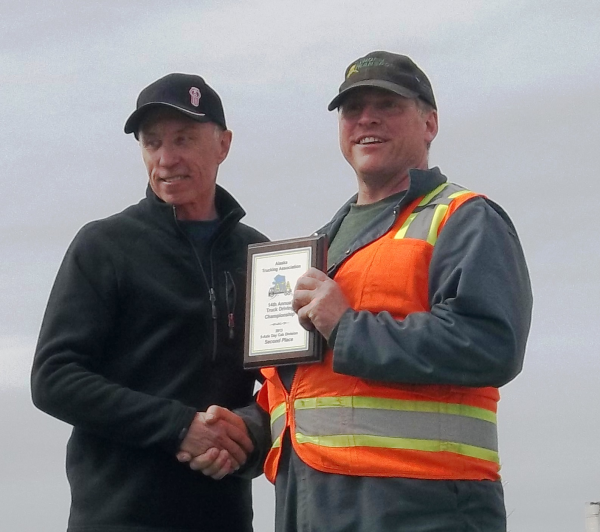 “We are proud of all 11 Lynden drivers who participated.” Drivers are required to complete an obstacle course, a written exam and perform a pre-trip inspection as part of the competition. In addition to taking the top three overall trophies, drivers placed in the following categories: Brian, first place, sleeper truck; Russ, first place, and Brian Aszmus (Lynden Transport) third place, 5-axle van; Steve, first place, 3-axle; and Jack Sorensen (Lynden Transport), second place, flatbed.